I have fond memories of eating grilled cheese as a child, and it’s one food that I’ve never gotten sick of and probably never will. As an “adult” I’ve revamped the grilled cheese to be even more delicious. Because I made this for lunch in the middle of the week I did not pair it with a beverage, but I think it would be delicious with a porter or amber ale. This soup is not made from scratch (I’m not that good). It’s Amy’s organic tomato soup, which can be found in the organic/gourmet section of your grocery store. It is easy and delicious. I add my own dried basil to the soup to give it an extra bit of flavor. This grilled cheese is like almost any other, but better. While heating up the pan, I throw in a pat of butter along with some fresh minced garlic. The butter is a staple of grilled cheese everywhere, and the garlic gives it some savory taste. For this sandwich I used deli slices of medium cheddar cheese along with some shredded fresh parmesan. (My family and I accidentally bought a giant block of fresh parmesan for a recipe and therefore I have been including parmesan in every meal since the holidays). The bread I use is Sara Lee’s Honey Wheat, just because it’s my favorite. 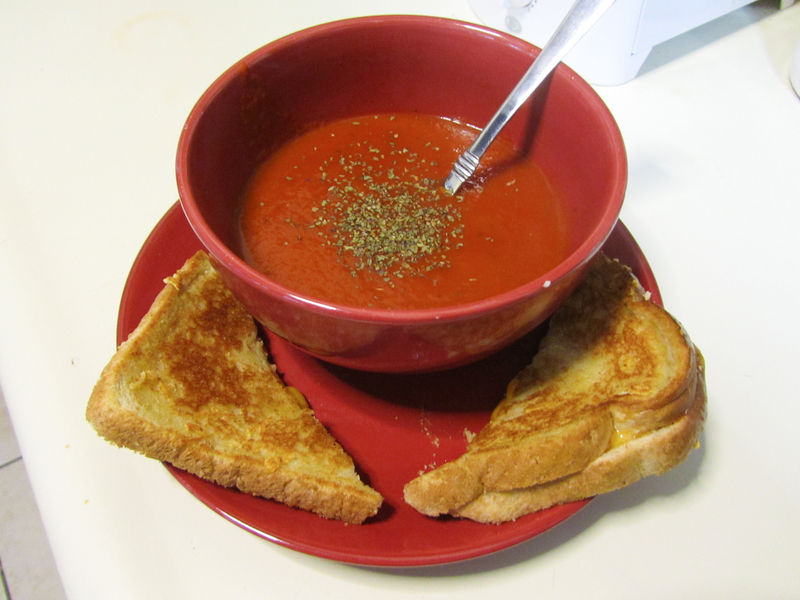 The combination of cheeses along with the garlic and the tomato basil soup is one of the best, most savory and satisfying winter lunches I can think of. Go get your cheese on! Great minds….I am making that for dinner tonight:) The basil in the soup is my favorite!